A total of 7,370 dengue cases have been reported in Singapore since the start of the year 2016. Four people have died of the disease so far – a 47-year-old man who lived in Marsiling Rise, a 67-year-old man who lived in Toa Payoh, a 63-year-old woman who lived in Bedok and a 73-year-old woman who lived in Hougang. The Ministry of Health and NEA have warned that the number of dengue cases in Singapore may exceed 30,000 this year, higher than the record of 22,170 reported in 2013. One of the main factors is the rising temperatures which caused faster breeding and maturation cycles of the Aedes mosquito population. 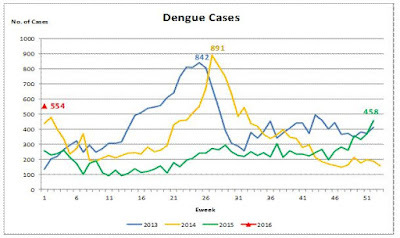 Correlation between increasing temperature and dengue? 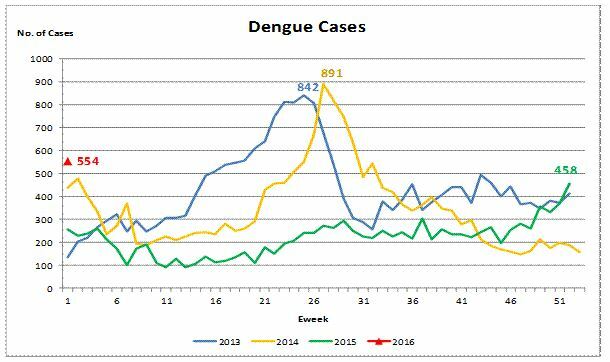 0 Response to "Increase in Dengue Cases in Singapore"